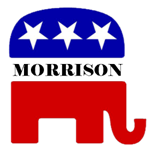 The Morrison County Republicans are dedicated to limiting the role of government, balancing government budgets, and promoting individual responsibility. We are located in the heart of Minnesota and are committed to electing and supporting Republicans in our area. Support our Republican State Candidates! Prepared and paid for by the Morrison County Republicans | PO 222, Little Falls, MN, 56345 | www.morrisongop.com | morrisongop@gmail.com | Not authorized by any candidate or candidate’s committee.